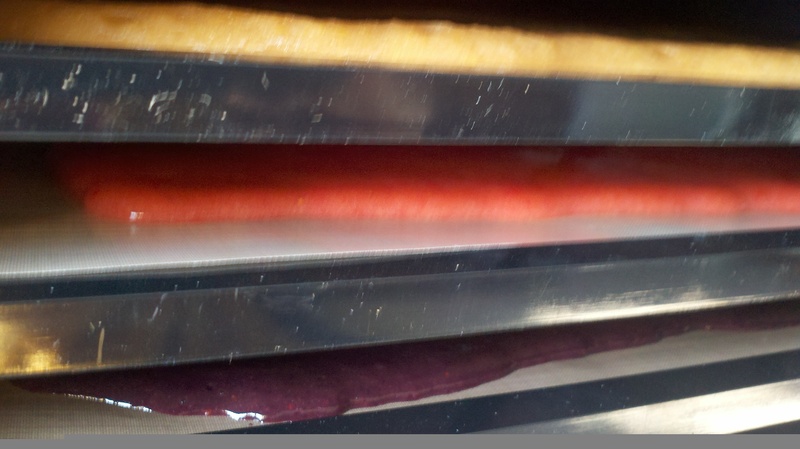 I’m making my first batch of fruit leathers ever! They are still in the dehydrator and I put them in around 4:10pm. I made three different ones: Blueberry Lavender, Just Strawberry & Cinnamon Pear. What I did was I blended up 12 ounces of blueberries until it was as liquifed as I thought my blender could get it to be. Then I added 1/2 teaspoon of fresh lavender that was soaking for an hour or so, just to make it a little easier on my blender since it’s a wimp. I blended that up for a bit, dipped my finger in to see if I was pleased then tried my best to evenly apply the puree onto a teflon tray to dehydrate. For the strawberries I just used 16 ounces of strawberries that had been diced, it made around 3 cups of strawberries. I blended this until it was a liquid and smoothed it onto a teflon sheet. The Cinnamon Pear fruit leather was a last-minute idea and I was so pleased with the puree when I had a lick from my blender! I diced two Bartlett pears with the skins on, 1/4 teaspoon cinnamon and just a dash of nutmeg. My blender hated trying to break down the pears so I added a splash of filtered water here and there. In total I probably put 4 tablespoon of water in the mix. The Blueberry Lavender mix was the thinnest in the first place and as you can see it will probably be the first tray I can pull from the dehydrator. Just Strawberry will most likely be all set right after. But the Cinnamon Pear is so thick and my blender isn’t that great causing this puree to have some chunks. I’m pretty excited to see and taste how they come out. I can’t wait to cut them up in crazy shapes and have these fruit leathers around for a snack. It can be such a struggle at times to have a raw snack when I am on the go or if something unexpected happens. Tomorrow I will have the finished product up here!